A new partner, the Page-Walker Arts & History Center of Cary, has just contributed 6 additional yearbooks for Cary High School, including the earliest volume on our site to date (1915). Cary High School was originally located in downtown Cary, in the building that now houses the Cary Community Arts Center. 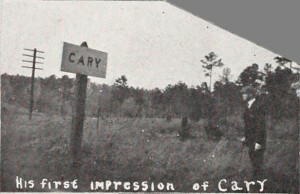 The photo above, from the 1917 Chsite, shows quite a different view of Cary than what we think of today. You can now view 22 yearbooks for Cary High dating from 1915 to 1962 on DigitalNC in our High School Yearbooks collection.